I'd write about Carlton missing the finals and firing Brett Ratten and the terrible run with injuries we've had this year... but I'd just spill more tears in my keyboard. 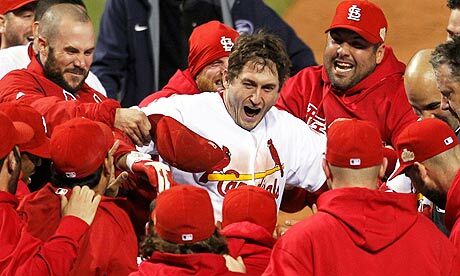 Instead, I'll write about my US sports team still shooting for a shot in the playoffs: "MY" St. Louis Cardinals. As I write, the Cardinals hold down a wildcard spot with a one game lead over Pittsburgh and San Fransisco. BUT only because MLB added an extra wildcard team to the playoffs in 2012. This year each conference will have TWO wildcard teams. (The two teams with the most wins who failed to win their division.) These two teams will play one, that's right one, uno, one game to determine who will advance to the playoffs proper. The fact that the rest of MLB is built around 3 & 4 game series in the regular season and 5 & 7 game series in the playoffs apparently doesn't challenge the integrity of a one game playoff. It's not just baseball that's illogical with its playoff system. Since I opened with an Aussie Rules comment I guess I can close with one too. (Read the complete list of VFL/AFL finals variations here.) The old VFL for many years just had the top 4 teams make the finals. Then in 1972 this changed to the Final Five. In the wake of Brisbane and West Coast joining the competition the finals were expanded in 1989 from the Final Five to the Final Six. In 2000 the league moved to the current Final Eight as there were then sixteen clubs. This crazy situation means that until Gold Coast joined the competition in 2011 you only had to finish in the top half of the competition to make the finals! Hardly a standard of excellence. But realistically, it's all about making money, not creating a fair system. I guess really, the most fair system is the English Premier League which simply rewards the team with the best record at the end of the season: No finals. The fact that only one AFL team has won the premiership after finishing fifth (Adelaide 1998) only adds to the futility of expanding the number of teams in the finals. At least in baseball 5 wildcard teams (including "MY" St. Louis Cardinals in 2011) have won the World Series demonstrating that it's reasonable for them to be competing. Although the movement is always to allow more teams to qualify for post-season play, it still irritates me. Making the playoffs should be a reward for a top season, not a right for being slightly better than average. I'm so glad that God's gone 2000 years without any changes to his requirements for qualifying for "post-life" experience. It must be tempting to change the standards and let more people qualify. After all, we know that God doesn't want anyone to miss out. (2 Peter 3:9) But God is consistent. Jesus is THE way, truth and life, "No one comes to the Father except through him." (John 14:6).